Brother John of Worcester was a scribe at Worcester Cathedral Priory who was instructed by his bishop, Wulfstan, to prepare this Latin chronicle. Chronicon ex chronicis — Chronicle of chronicles — is a world history which begins with the creation and ends in AD 1140. The framework of the Chronicon was provided by the chronicle of Marianus Scotus, an Irish monk living in Mainz who died there in 1082. Marianus’ Chronicon was probably completed by 1076 and copies are held in the British Library and the Vatican. It was very popular in the Middle Ages and a copy was brought to Hereford by Bishop Robert (1079-95). 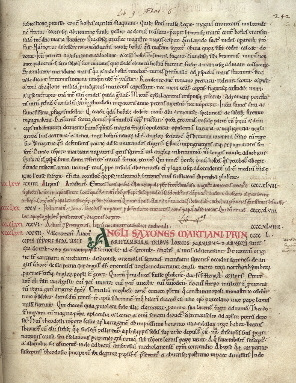 In his chronicle John used three other sources in particular - Bede’s Historia Ecclesiastica, Eadmer of Canterbury’s Historia Novorum (for events between 1102 and 1122) and lastly the great Anglo-Saxon Chronicle. John received help from a fellow monk at Worcester, Florence, whose work is acknowledged in the entry for AD 1118. There is also the chronicula, a minor chronicle up to 1123 based on the Chronicon: MS 503 (Dublin, Trinity College). The MS of the Chronicon mostly used here is the MS Corpus Christi 157, which belonged to Worcester. For the period from 446 AD it was transcribed by Benjamin Thorpe in 1848 and from 1118 AD by J.R.H.Weaver in 1908. It was translated by Thomas Forester / published by Henry G. Bohn in 1854. The principal manuscript is in Latin, with tinted and painted drawings of the Crucifixion, sunspots and visions of Henry I. It is a fair copy up to AD 1128, with the annals for 1128-31 rewritten and continued to 1140 by a third hand, probably John himself, at Worcester Cathedral Priory. Oxford University has released a detailed scan of the manuscript for research purposes on its “Early Manuscripts at Oxford University” website. My illustration gives an impression of the first page of this translation but viewing the detailed scan is highly rewarding. It seems that the work is not as well known as it perhaps should be. One curiousity that should be mentioned is that Brother John shows Marianus’ dates alongside the now accepted Dionysian calendar. Marianus reckoned that Dionysus had the birth of Christ twenty-two years late so in the text John has put, for example, at the left-hand end of the dateline MCLII for 1152 AD and, at the right-hand end, MCXXX for 1130 AD. The translation needless to say is arranged by the latter modern date.